The Japanese tattoo style, commonly referred to as Irezumi, is a worldwide phenomenon today, but it arose during the Edo period (1603-1868) – a time when its homeland was undergoing a renaissance due to widespread prosperity. The country’s thriving economy enabled artistic individuals from its burgeoning middle-class to create a variety of new art forms that reflected their way of life. Among these art forms were two particularly influential ones: ukiyo-e – Japanese woodblock prints – and kabuki, the country’s renowned style of theatre. But how did these majestic scenes printed on silk and melodramatic, slapstick stage-productions inspire one of the richest tattoo styles in the world? A novel called the Suikoden (The Water Margin) is primarily responsible for introducing the art of tattooing to the popular Japanese imagination. The book is a translation, one of the four major classical texts of China, which tells the tale of 108 renegade warriors, some of whom were coincidentally tattooed, who staged a rebellion against a tyrannical, warmongering emperor. This story of civil unrest spoke to the growing Japanese middle-class of the Edo period, who were, like the rebels in the novel, frustrated with the more oppressive aspects of Shogunate rule – mainly, the fact that they were subject to countless injustices based on their social standing. For these reasons, among many others, the outlaws became folk heroes in Japanese eyes and depictions of them started appearing in both ukiyo-e and kabuki and other art forms. In the Suikoden, four prominent characters are described as being heavily tattooed, featuring back-pieces and sleeves filled with dragons and other imagery now belonging to the style. When Japanese artists started to depict the characters, they remained true to the source material and illustrated or costumed their characters with body art. Within just several short decades, the popularity of tattoos exploded in Japan, and the style, as we recognise it, began to take shape on people’s bodies. Irezumi is home to mythological creatures, animals and plant-life, frightening demons, bizarre ghosts, and fearsome samurai warriors, which are all traditionally rendered with black backgrounds that utilise negative space to create the appearance of the country’s natural landscape. Many of these captivating figures come from Shintoism, some from nature, and others from Japanese folklore. Together, they paint a vibrant picture of the country’s rich culture and past. We cannot emphasise the importance of backgrounds – often referred to simply as wind-bars, clouds, and waves – enough. They firmly ground every image in a sublime landscape, are a vital part if the creative process, and a quintessential element of the aesthetic of Irezumi. “I’ve always liked to incorporate nature into my drawings, and I’m especially drawn to the Japanese style because of how it depicts elements – wind, water, rocks, leaves, and more,” explains Davide, one of our artists at Cloak and Dagger. 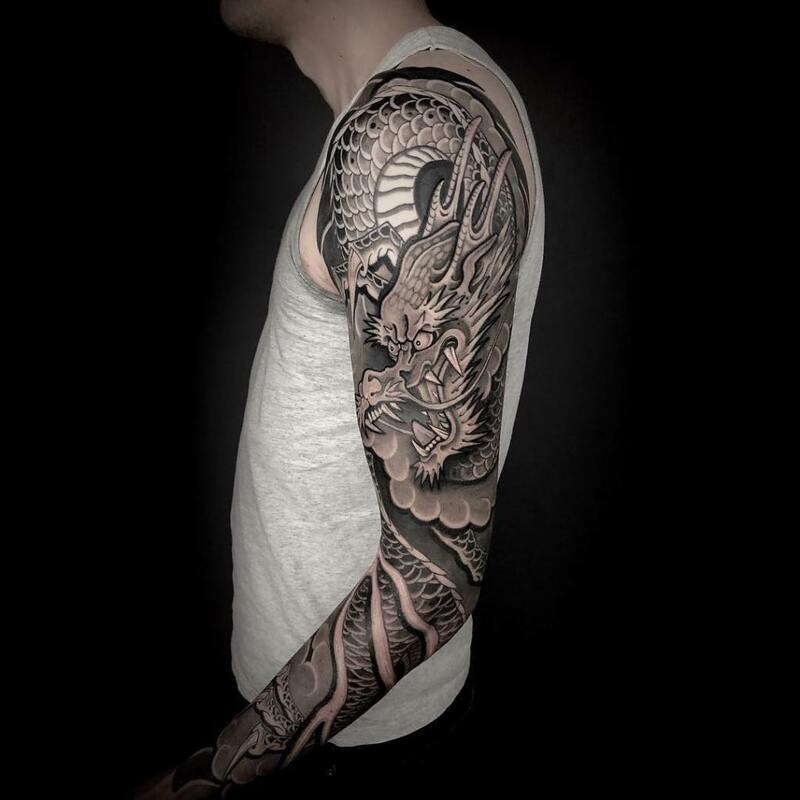 Whether it’s magical nine-tailed foxes, serpentine dragons, or giant golden koi fish, tattoo artists who work in the Japanese style and Irezumi collectors alike have their favourite traditional motifs. Davide, for example, enjoys recreating the masks traditionally worn in kabuki performances as tattoos, especially that of the hannya – a vengeful female spirit hellbent on ruining adulterous men. Not all of the images found in contemporary Japanese tattoos – hannya, dragons, and other extraordinary beings – however, are mythological in nature. Some of the style’s most iconic figures take after realistic subjects, such as the natural flora and fauna of Japan and historic characters from the country’s past. When working on large-scale compositions, another one of our artists, Michele, loves the rare opportunity to make tattoos of tattooed warriors, the very same folk heroes that inspired the Irezumi hundreds of years ago. Whatever iconic image is your personal favourite, when it comes to selecting the perfect figure for you, we suggest doing a little research first and consulting our artists who specialise in the style. That way, you know the exact details of the story behind the design you select. We are deeply invested in the history and meaning behind the imagery we illustrate. Irezumi is, in essence, a form of visual storytelling with a long tradition of passing down Japan’s folklore, and we think it’s important to maintain this strong tradition by preserving the tales of old. Even something as simple as cherry blossoms, for example, have tremendous cultural significance and are to not be taken lightly. The pink blooms that appear so commonly as tattoos are the national flower of Japan and are one of the most significant plants that crop up in traditional Japanese tattoos. Every spring, when the trees are in full bloom at the end of March and begin to release their petals, Japanese people gather with their loved ones to participate in Hanami – the appreciation of sakura (cherry blossoms) – celebrating the renewal of life. The iconography of Irezumi is a major part of why the style’s survived for so long, but the style owes its longevity to more than its striking imagery and breathtaking aesthetic; another substantial reason why Japanese tattooing has stood the test of time rests in the creative process itself. Unlike some other styles, Irezumi is almost always done on a large-scale. To put it in other words, compositions in the Japanese style tend to take up large amounts of space on the body, which enables artists to create intricate, elaborate scenes, but let it be known, they also require hours of tattooing to complete. Disclaimer: the process of creating a back-piece, sleeve, or bodysuit is extremely time-intensive. Compositions can take tens to hundreds of hours to complete, depending on their size. First comes the outline, which is typically extremely detailed; then comes the back-grounding in heavy black ink, which can take multiple sessions to fully fill in; finally, the artist adds in contrasting colour schemes to bring the primary figures to life, which requires a significant amount of more chair-time. It’s a lot to endure, but the best things in life are worth waiting for, even if it hurts. It ultimately takes weeks, months, and sometimes years of sitting through sessions to finish a large-scale piece of Irezumi, and over that time period, collectors and artists tend to establish bonds through their shared understanding and appreciation for everything that goes into the project. It’s a shared journey, a kind of rite of passage into a larger community of tattoo enthusiasts. If you ask any tattoo enthusiast, they’ll most likely agree that Irezumi is one of the greatest artistic legacies of Japan, but if you said that to the everyday Japanese citizen, they’d probably disagree if not be outright offended. Regrettably, the tattoo style has suffered from a stigma in its homeland due to an association with criminality ever since its beginnings. After all, the characters who inspired the art form were outlaws, but that’s far from the only reason why so much prejudice toward Irezumi exists in the place of its birth. Before the style’s origin, tattoos were used as a way to mark criminals in Japan. Imperial officers would often tattoo people who committed crimes with small markings to designate them as social deviants. It only made sense that some of these individuals choose to have these shameful markings covered up with large-scale pieces when Irezumi rose to prominence, but not every person who collected Irezumi were criminals. Quite the contrary, one of the most heavily tattooed sects of the populace were actually volunteer firemen, known as hikeshi, who wore their body art as a sign of community pride and distinction for their heroic actions. Regardless of the fact that few Irezumi collectors engaged in criminal activity, the false association has incessantly plagued the art form, even forcing it underground in Japan on several occasions throughout the country’s past. At first, there were little to no restrictions placed on tattoos in Japan, though having them would have probably gotten some nasty looks from the aristocratic members of society. All of that changed in the late-19th century, though. In an effort to appear “more civilised” to the Western world, the Japanese government banned the practice of tattooing in 1872. While it forced Irezumi artists underground, devotees refused to let the art form die, and kept practicing it behind closed doors on a word-of-mouth basis. The people who got tattoos had to be careful not to let them slip out from under their clothing while making their daily rounds. The ban only further cemented the link between crime and Irezumi, strengthening the taboo. Creating Irezumi and showing it off in public remained a punishable offence until 1948 when the official ban was lifted because tattooing became a more profitable sector of the tourism industry in the wake of World War II. The legalisation of tattooing in Japan, however, did not reduce the stigma surrounding the art form. Prejudice toward Irezumi and its collectors was as strong as ever, especially among the more conservative, older members of the Japanese populace. In short, it was fine if tourists got tattoos, but it was frowned upon when locals got them. As it now stands, the stigma is as strong as ever. Even worse, Irezumi has recently been linked to Japan’s most notorious and vicious gangsters – the yakuza. Most of the political power in Japan belongs to the older generations, and most of the individuals who embrace Irezumi are of the younger, unempowered generation. Because of this cultural dynamic, chances are that the stigma will not go away for decades to come, and Irezumi artists who operate in Japan are suffering because of it. In recent years, there has been a crackdown on tattoo artists throughout the country. The authorities have been raiding shops and charging tattooists for practicing without medical licenses. For many who practice the style in its homeland, this has made it impossible for them to keep their businesses open. The centuries-long suppression of Irezumi and the Japan’s generational divide have inevitably led some artists to migrate over the years, taking their services elsewhere. While it’s tragic that their lives were uprooted, their displacement was also what eventually led to the style becoming an international sensation. As Irezumi found its way to every continent, excluding Antarctica, it also started to adapt to its new settings, taking on new attributes as artists tried their hand at the style, adding their own influences and nuances to it. Though the style has veered slightly away from the traditional, it still remains in touch with its roots. In other words, a hannya is a hannya is a hannya; the foundational elements of classical Japanese iconography always stands out no matter how stylistically enhanced the tattoo is. There’s a reason artists have been drawing them that way for nearly half a millennium: they look amazing. Our artists represent the wide spectrum of styles within the Irezumi as a genre. Some of us stick closer to the traditional designs of old masters – called hori – who’ve handed down the art form ever since its meagre beginnings way back in the Edo period. Others of us revel in elaborating on traditional designs in exciting new ways, but ultimately we are all committed to remaining true to all of the wonderful qualities that make Irezumi such an awe-inspiring form of body art. Though it’s currently struggling in its homeland, Irezumi is flourishing like wildfire elsewhere. More people are collecting Japanese tattoos and more tattooists are practicing the style than ever before. At this rate, Japan will inevitably have to acknowledge the value of the style and give it the recognition it deserves. A generational shift is just over the horizon in Japan, and with it, a new day will dawn for the art form. Until then, the style and everything it represents – the folklore, history, and symbolism – lives on in tattoo shops like ours. If you’re interested in learning more about this powerful, profound, and time-honored art form, pay us a visit at Cloak and Dagger or, better yet, set up an appointment with one of our experienced Irezumi artists. It would be our pleasure to discuss the meaning and history behind the perfect Japanese tattoo design for you.